Player Projection have been updated for the rest of the season. The blank fixture is accounted for this week for those teams affected but as they'll play it eventually before the end of the season it's will accumulate to each players 10 wk forecast. 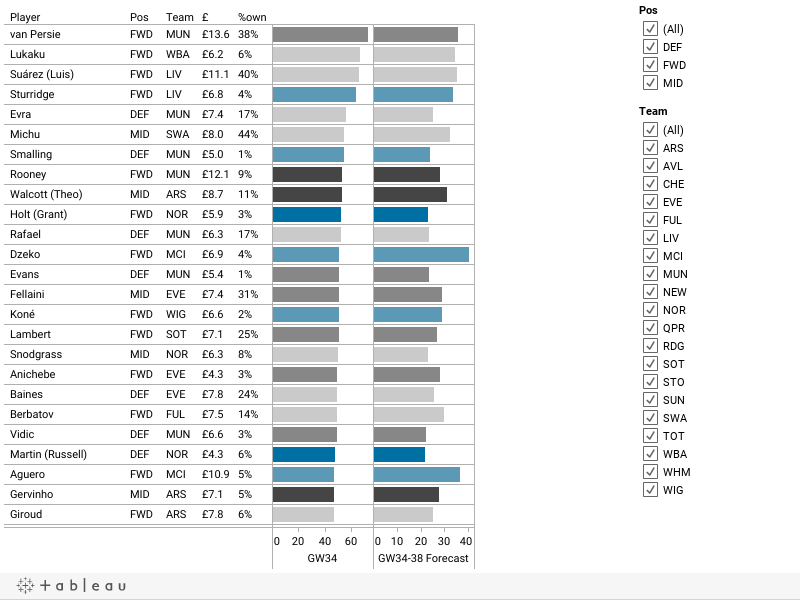 A reminder that the darker grey / black the player's bar the more overperforming they are to/he model, blue indicates underperformance (i.e. they haven't scored as many fantasy points as their data would suggest. At this stage in the season I would say we have enough data on most players that consistent, season long, overperformers have not jsut 'got lucky' for 28 games and are the real deal. If you enjoy these projections and posts please 'Like It' on Facebook. I thank you.